The e-Diasporas Atlas is a unique experiment in research on diasporas as well as in publishing, a first in the restitution of scientific findings and their presentation. Historically, the emergence of e-diasporas occurred in tandem with the diffusion of the Internet and the development of multiple online public services. At the end of the 1990s, a number of institutions joined forces with the new ‘e’-technologies (e-administration, e-democracy, e-education, e-healthcare, e-culture, e-tourism), which gave rise to the first presence on the Web of associations run by migrant populations. If the earliest websites were produced by IT professionals, we soon saw the diffusion of the Web in all of the diasporic communities and at all levels. The last ten years witnessed the use of both Webs 1.0 and 2.0 in these communities as well as the widespread appropriation of the various social-networking platforms (Facebook, Twitter, LinkedIn, etc.). These new communication and organization practices have produced a vast, moving e-corpus, whose exploration, analysis and archiving have never before been attempted. The outcome of the efforts of more than 80 researchers worldwide, the e-Diasporas Atlas is the first of its kind, with some 8,000 migrant websites archived and observed in their interactions. origin. Migrant sites testify to a given e–diaspora’s occupation of the Web. What we call e-diaspora is a migrant collective that organises itself and is active first and foremost on the Web: its practices are those of a community whose interactions are ‘enhanced’ by digital exchange. An e-diaspora is also a dispersed collective, a heterogeneous entity whose existence rests on the elaboration of a common direction, a direction not defined once and for all but which is constantly renegotiated as the collective evolves. An e-diaspora is an unstable collective because it is redrawn by every newcomer. It is self-defined, as it grows or diminishes not by inclusion or exclusion of members, but through a voluntary process of individuals joining or leaving the collective – simply by establishing hyperlinks or removing them from websites. An e-diaspora is both ‘online’ and ‘offline’. We are therefore interested in both the digital ‘translations’ of ‘physical’ actors/phenomena (the online activities of associations, for example) and the specifically (‘natively’) digital actors/phenomena (e. g. a forum and its internal interactions), what are sometimes called pure players. The question of ‘rub–offs’ – reciprocal influence between these two sorts of Web entity – is of capital importance in analysing an e–diaspora. It is thus clear that the research carried out in the context of the e–Diasporas Atlas presupposes knowledge of the diaspora in question and, based on exploration of the Web, calls on new research in the field. It also implies knowledge of the Web and an appreciation of the singularity of the exchanges that take place there. The e-Diasporas Atlas was incubated and developed in the framework of the Fondation Maison des Sciences de l’Homme ICT Migrations program. Initiated and coordinated by Dana Diminescu, the project introduced digital methods into research on diasporas. This was made possible by the R&D innovations of Mathieu Jacomy and thanks to the technical coordination and training provided by Matthieu Renault. Some eighty researchers from diverse disciplines, laboratories and countries took part in the project. Several partners also contributed to its success: the Institut National de l'Audiovisuel, the Centre National de la Recherche Scientifique through its Migrinter laboratory, the Institut Mines-Telecom, Linkfluence and the design studio Incandescence. The e-Diasporas Atlas received funding from the Agence National de la Recherche (STIC Content and Interaction), the École d'ingénieurs Telecom ParisTech and the Fondation Maison des Sciences de l’Homme Paris. A migrant site is a website created or managed by migrants and/or that deals with them (at any rate, a site for which migration or diasporas is a defining theme). This can be a personal site or blog, the site of an association, a portal / forum, an institutional site, or anything similar. Usage is not the criterion: a site often consulted by migrants (a media site, for example) is not necessarily a migrant site. What distinguishes ‘activity’ is first and foremost the production of content and the practice of citation (hyperlinks). On the other hand, a migrant site need not necessarily be located in a foreign country; it may just as easily be in the country of origin. Migrant sites testify to a given e–diaspora’s occupation of the Web. What we call e-diaspora is a migrant collective that organises itself and is active first and foremost on the Web: its practices are those of a community whose interactions are ‘enhanced’ by digital exchange. An e-diaspora is also a dispersed collective, a heterogeneous entity whose existence rests on the elaboration of a common direction, a direction not defined once and for all but which is constantly renegotiated as the collective evolves. An e-diaspora is an unstable collective because it is redrawn by every newcomer. It is self-defined, as it grows or diminishes not by inclusion or exclusion of members, but through a voluntary process of individuals joining or leaving the collective – simply by establishing hyperlinks or removing them from websites. We prefer the term ‘e–diaspora’ to that of ‘digital diaspora’ because the latter may lend to confusion given the increasingly frequent use of the notions of ‘digital native’ and ‘digital immigrant’, in a ‘generational’ sense (distinguishing those born before from those born during/after the digital era). The object of the e–Diasporas Atlas is not this ‘digital migrant’, however, but the connected migrant. The digital methodological chain and the tools we developed for building the e-Diasporas Atlas aim at mapping and analysing the occupation of the Web by diasporas. The chain is composed of four interlocking steps: (1) equipped Web exploration and corpus building; (2) data enrichment (location, languages, text-mining); (3) network visualization-manipulation and graph interpretation; (4) collaborative sharing of (raw) data and findings. In making a chapter of the Atlas, the first step is to build (and circumscribe) a corpus of websites. The researcher plays a crucial role in this process inasmuch as his knowledge of the fieldwork allows him to discriminate the relevant resources for a given diaspora. An e-diaspora is ‘captured’ by constituting a corpus of websites. This method entails breakdown and selection, which allow extraction of a diaspora web. But definition is also necessary because an e-diaspora presents itself to the researcher only as a product of this ‘excision’ performed upon the Web. Similarly, it is only because of such exploration / selection, the filtering / circumscription of a corpus, that what a migrant site actually is takes on meaning. In order to complete this stage of collection, the researcher needs to be equipped. The identification of relevant websites is achieved semi-automatically thanks to a software called Navicrawler, which makes it possible to scan web grounds using a web-browser. Navicrawler is a Firefox add-on designed and developed by Mathieu Jacomy. The interface is located on the left of the currently browsed page. Navicrawler works essentially by scraping the out-links of the visited websites (listed and stored as ‘Next Sites’). The reasearcher can then incorporate each website into the corpus, where it becomes an ‘In Site’, or can reject it, and then it becomes an ‘Out Site’. The researcher can also describe the websites by adding tags. The logic of exploration induced by Navicrawler combines browsing and crawling. Unlike automatic crawling, it allows the researcher to perceive the context of links and thus to avoid a blackbox effect. 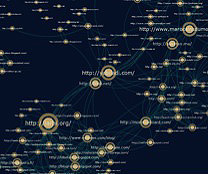 At the end of this exploration stage, he is able to export his corpus as a graph in which the nodes represent the websites and the edges stand for the links between them. Retrieving from a list of URLs the information provided by the registrar (ICANN) about the registrant (owner of the domain name), especially his or her geographical location, about the server hosting the website, etc. Text-mining used on the index of the corpus in order to retrieve named entities: persons, organizations, places, etc. (using Open Calais API). Recognition of the languages used in each website (and the distribution of languages in order to study multilingualism, an important issue in migration studies). a geographical spatialization that uses geocoded data: location of website owner, website addressees, servers, etc. (especially information retrieved during the data enrichment stage). Maps: browsable graphs of the corpus, with different views according to the fields of classification. Raw data: the empirical data (texts, videos, images interviews, etc.) produced/retrieved and used during the research. The e-Diasporas Atlas is part of the more general ‘digital humanities’ project to provide access. It diffuses not only the research results but also the research data. Statistics: these are automatically generated from both the classification and the graph structure; they provide quantitative data about the relations between categories / actors. Statistics help strengthen the hypothesis formulated from the graph visualization. 1. A topological key, centred on analysis of the connectivity between the actors on the Web. A quanti-qualitative key, which provides information derived from exploration of the contents of every site and from confrontation with the fieldwork and the expertise of all researchers involved in this project. The network is the very image of a diaspora. In its web-like structure can be read the spatial distribution of a geographically dispersed collective and its remote organization. A large majority of e-diaspora sites are geolocated in North America and especially in the United States. This predominance is even more surprising when the presence on the Web strongly contrasts with the presence in the geographical areas, as was observed for the Chinese, Palestinian and Nepalese diasporas (among others). Wishing to understand the collective life of the e-diasporas, we sought to identify clusters of expatriates on the Web and the exceptions to these clusters, their centrality, their hierarchies, their relations and their assemblage. Although the place of origin appears as a reference on the Web, even if it does not act as a hub (cf. the Palestinian diaspora), it re-injects geography into the Web. The auto-organization typical of Web networks facilitates the emergence of decentralized communities and acts as an ideal platform or vehicle for a transnational collective imaginary. This is the case, for instance, of the Huyghurs, the Hmong or the Nepalis. Mapping the e-diasporas enables us to analyse, among other things, the relations entertained by various diaspora actors with their homeland: clearly labelled links with a strong state, as in the case of France, one-way to non-existent links, as in the case of Morocco, or Mexico for instance. 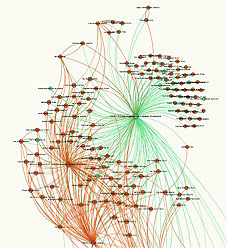 As for the links between actors within an e-diaspora, the e-Diasporas Atlas gives a glimpse, before going into further detail, of associations unaware of one another, of bloggers creating their own world, of activist groups or individuals seizing power on the Web and sometimes, as in the case of the Arab springs, even managing to spark popular dissent and to impact on political events. India, with its many and widely dispersed communities, was our laboratory of choice. Far from having exhausted the exploration of the Indian e-diaspora, a thorough search organized around regional and religious components resulted in nine sections, among which an effort to gain an overall picture. The first thing we observe is the density and duration of the association sites, some of which go back more than 20 years. Next, a non-negligible visibility of the government sites, which seek to attract the most privileged and influential migrants. Highly visible as well are two opposing activist movements: on the one hand, the nationalist religious hindutva movement, ideologically attached to the territory of India, institutionally installed in the United States and run by a conservative, male elite; on the other hand, a militant movement that rejects nationalism in favour of an all-South-Asian regional identity based on defence of the interests of all minorities marginalized because of caste, gender, sexual orientation, religion or ethnic belonging, whatever their geographical location. The paper version is composed of three composite maps, which introduce the reader to graphic representations of some thirty e-diasporas. An application — which can be downloaded free from the App Store — enables readers equipped with an iPhone to access articles and videos by the researchers concerned via the graph accompanying each diaspora. This additional pedagogical material expands on the interpretation of the moments T frozen on the paper page. This application also provides a link to a third and even richer level of reading: a companion website provides a space allowing the user to appreciate the full dynamic evolution of the corpuses and visualize them in their entirety. This digital restitution makes it possible, in particular, to access personally the e-Diasporas research tools and platform, to manipulate the maps, to cross and compare the data and to move about within the graphs. e–DIASPORA: A migrant community as it organises itself and acts via various digital media, particularly on the web, and whose practices are those of a community whose interactions are ‘enhanced’ by digital exchange. An e–diaspora is a dispersed collectivity1. It is both ‘online’ and ‘offline’, so what interests us is both the digital ‘translations’ of ‘physical’ actors/phenomena (the online activities of associations for example) and the specifically (‘natively’) digital actors/phenomena (e. g., a forum and its internal interactions), what are sometimes called pure players. The question of ‘rub–offs’—reciprocal influence between these two sorts of web entity—is of capital importance in analysis of an e–diaspora. It's thus clear that research carried out in the context of the e–Diasporas Project presupposes a knowledge of the diaspora in question and, based on exploration of the web, calls on new research in the field. It also implies a knowledge of the web and an appreciation of the singularity of the exchanges that take place there. DIASPORA WEB: An ensemble of the ‘migrant sites’ and ‘neighbouring sites’ (cf. infra) of a given diaspora, whether such sites be ‘living’ or ‘dead’ (cf. infra, ‘dead site’). In a sense, the web ecosystem of a diaspora. e–DIASPORA CORPUS: The constitution of a corpus of websites is the method used to ‘capture’ an e–diaspora. A question of breakdown and selection that allows extraction of a diaspora web, it is also a task of definition in that a diaspora web presents itself to a researcher only as a product of this ‘excision’ performed upon the web. Similarly, it is only because of such exploration/selection, this filtering/circumscription of a corpus, that what a migrant site actually is takes on meaning. MIGRANT SITE: A website created or managed by migrants and/or that deals with them (at any rate, a site for which migration is a defining theme). This could be a personal site or blog, the site of an association, a portal/forum, an institutional site, or anything similar. Usage is not the criterion: a site often consulted by migrants (a media site, for example) is not necessarily a migrant site. What distinguishes ‘activity’ is first and foremost the production of content and practice of citation (hyperlinks). On the other hand, a migrant site need not necessarily be situated in a foreign country and may just as easily be in the country of origin. Migrant sites testify to a given e–diaspora's occupation of the web. NEIGHBOURING SITE: A non–migrant site (or one belonging to an e–diaspora other than the one being studied) which distinguishes itself by its strong connection with the (migrant) sites of a given e–diaspora (governmental or media sites of the country of origin, for example). However, not every site strongly linked to an e–diaspora is necessarily a neighbouring site. To be one it needs to be ‘specific’ to the diaspora in question which is why sites ‘on the fringes of’ the majority of web communities, particularly those in the upper layers of the web, Google, Youtube, Facebook and so on (cf. the diagram below), are not counted as ‘neighbours’. In the e–Diasporas Project, a list of neighbouring sites may be drawn up alongside that of migrant ones. These neighbouring sites discovered during the prospecting phase are not crawled during subsequent prospection but only during the phase of validation so as to gather together all links with the migrant site. 1 That is to say “a heterogeneous entity whose existence rest on an elaboration of a common direction, a direction not defined once and for all but which is constantly renegotiated throughout the evolution of the collective” (Turner). Furthermore, we prefer the term e–diaspora to that of ‘digital diaspora’ since the latter runs the risk of becoming a source of confusion given the increasingly frequent use of the notions of ‘digital native’ and ‘digital immigrant’ in a ‘generational’ sense (distinguishing those born before from those born during/after the digital era). The object of the e–Diasporas Atlas is not the ‘digital migrant’ but the migrant online. NAVICRAWLER: Navicrawler is an extension of the Firefox Web browser, this is a semi–automatic search tool which analyses the structure and content of pages and hyperlinks in order to assist the user during a browsing session. It helps the researcher in creating a corpus of websites related to his/her topic of study. This tool was developed chiefly by Mathieu Jacomy in the framework of the ICT-Migrations research program. 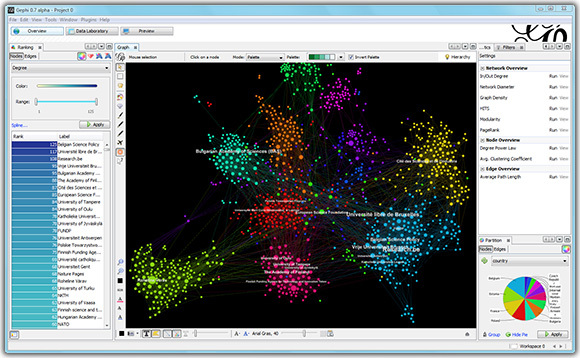 GEPHI: Gephi is an interactive visualisation and exploration tool for all types of networks, complex systems, and dynamic and hierarchical graphs. In the e-Diasporas Atlas, it has been used to visualise and interpret the structuring and distribution of actors in migrant-community networks on the Web. 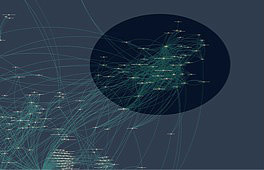 The Gephi project was initiated by Mathieu Jacomy, in the context of the ICT-Migrations research program, and was then developed by Mathieu Bastian and Sébastien Heymann. THE AUTOMATIC CRAWL (following the creation of a first Navicrawler corpus): A crawler is a ‘robot’ (computer program) which automatically browses the web based on a given list of URLs and follows all hyperlinks on the pages visited. 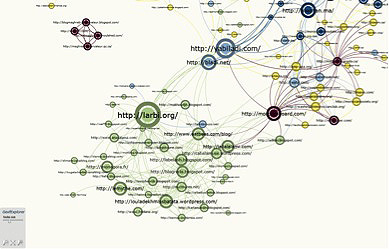 A depth of exploration (number of successive ‘external’ hyperlinks—between one site and another—to be visited) is fixed as the crawl parameter and the results are stocked in the form of a graph whose nodes are pages or websites (sites in the case of e–Diasporas), and arcs the hyperlinks connecting them (note that, where e–Diasporas is concerned, site content is not indexed). As an example, a crawl to distance 1(visits to initial sites plus those linked to them) on a corpus of around fifty sites will come up with thousands and even hundreds of thousands of results. Most of these are anything but pertinent to a given corpus (we estimate that 1—10% actually are), so the results then need to be filtered. Two pointers are used by e–Diasporas: the number of initial sites referring to a given site discovered, and the number of initial sites to which it, itself, refers. ADDITIONAL TOOLS: Over and above the tools specially developed for the e–Diasporas Atlas, there are other applications that may be useful to researchers. This is particularly the case with whois which facilitates the gathering of information concerning the geographical location of sites and their ‘registrants’ (the information sometimes concerns only the localisation of the web host hosting the site and this is of little value). Cf. for example, http://www.coolwhois.com. For other tools developed by Digital Methods in Amsterdam which may prove useful. In the context of the e–Diasporas Atlas, it is the graph that primarily allows formulation of research hypotheses. Graphs serve not so much as demonstration/explication as an embodiment of the construction of an interpretation of data. They thus all have a heuristic function, their interpretation being an aspect of visual analytics. MAPS — BETWEEN GRAPH AND TABLE: Graphs produced for the e–Diasporas project are quite particular. They're actually ‘minor graphs’, at least when compared to those handled by researchers in other fields. There's an essential qualitative aspect to our graphs insofar as the data are extremely precisely described/classified by the researchers. The graph's topological structure (the hyperlinks) independent of the classification of the sites in tabular form is of no interest to us. E–Diasporas maps are a product of the fusion between the structure of graphs and the structure of tables. Since the networks themselves are small, one can easily ‘see’ the structures, which are never particular complicated: a small number of more or less dense ‘packets’ linked in certain ways, occasionally with points or centres and, and, possibly, a polarisation (cf. infra). The question is ‘Why is it like this?’ and the answer lies in categorisation. One intuitively finds that such–and–such a packet corresponds to such–and–such a particular sort of site, polarises itself according to these other criteria and so on (cf. infra). One examines how the sites classify themselves according to several norms, and needs only count them and draw up proportions and crossovers utilising classical statistics and ignoring links just as if one were dealing with the simple columns of a table describing the sites involved. THE VARIOUS TYPES OF GRAPH/MAP: There are several kinds of map in the e–Diasporas platform. On its front page the researcher will first find a series of small maps giving an overall view of the various corpuses. These are known simply as thumbnail maps. Clicking on the section that interests them, they will then access a general, ‘unicolour’ map devoid of classifications. This is the so–called map foundation. Exploring this map, they will then gain access to a series of maps coloured according to various fields of classification. These are the so–called thematic maps. GRAPH ORIENTATION—CENTRE AND PERIPHERY: The ‘north/south’ and ‘east/west’ orientations of nodes comprising a graph have no meaning here. Otherwise put, rotations such as may be applied to a graph have no effect on it: it remains the same graph. All that is to be considered is the relative distribution of its nodes, their position as regards each other (except for nodes whose positions are without connection and which are thus without significance to the graph and may just as well be represented by a list). The notions centre and periphery (be this on a graph as a whole or on some sub–graph) are of far greater importance in this regard in that they inform as to the degree of influence a node has, as also does that of distance. For all that ‘visible’ distance is a source of information, however, it has no ‘absolute’ value: the actual distance between nodes on a graph is the number of links one needs follow to get from one to another. If the arcs of a graph have ‘direction’—which is the case for a web graph—the distance from A to B is not necessarily the same as that from B to A.
IDENTIFYING MAP COMPONENTS—STUDYING CLUSTERING: The first reading of a graph—particularly of a map foundation—consists in the identification of its components. 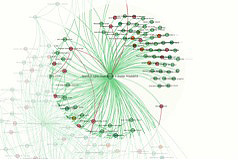 First one identifies clusters, groups of sites far more clearly linked to each other than to the rest of the graph. In the absence of a veritable cluster, particularly when a graph is dense and may, itself, constitute a relatively homogeneous ‘whole’, one may attempt to identify its denser seeming zones. This could also be expressed negatively by attempting to identify its ‘holes’, its ‘empty zones’. It also implies considering whether the graph has a principal component (often the graph's centre) and series of ‘subordinate’ ones, or whether it is simply a multiplicity of components that are actually ‘independent’. Based on this step, the researcher may then identify the reasons for these preferential attachments within the graph and come to understand ‘what makes it cluster’. If this is not clear, they should make use of visualisation (cf. infra) according to category and/or ‘quit’ the graph to look for explanations elsewhere on–site. IDENTIFYING A COMMUNITY: How does one identify communities with a graph? Note that a cluster is not necessarily a sign of the presence of a communal structure in the strictest sense of that word. It is not enough, for there to be a community, that there be a few ‘large’ and influential sites (‘hubs’ or ‘authorities’, for which, cf. infra), there also (even only) has to be a multiplicity of ‘small’ sites, well connected among themselves. Simply put, the network should be more like a ‘spider–web’ than a ‘star’. This (black circle) is a community. which are, themselves, barely or not at all connected to each other. 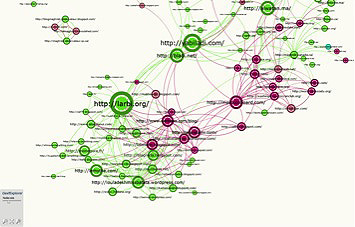 IDENTIFYING ‘HUBS’ AND ‘AUTHORITIES’: In a graph, a hub is a node with a large number of links leading from it—‘a site that cites a lot’, so to speak. An authority is a node with a large number of links leading towards it, ‘a site often cited’, or, one might equally say, a site with a lot of influence. Authorities are easily identifiable in the graphs produced in e–Diasporas: they're the biggest nodes on the graph (the size of the node being determined by the number of links entering it). Hubs are also fairly easily recognisable: they're the ones ‘stars’ form around, or, again, the ones with the most similarly coloured links around them (links of the same colour being those that link away from the node). A site acting as an authority bears out its influence, its notoriety within the e–Diaspora. Although it's far easier to produce links (links going out) than to receive them, hubs are nevertheless also fairly important in that they can reveal a certain linking policy (if we consider, for example, those institutions trying to ‘catch’ their diasporas by linking themselves to them… the next question being how efficient such policies might actually be). ‘BRIDGE’ SITES: ‘Bridge’ sites are sites that play a role of ‘way–station’ between two or more components or clusters in a graph. In the e–Diaspora Atlas, where nodes are precisely qualified and clusters regularly correspond to categories defined by the researchers themselves, the positioning and the interpretation of the content of such sites is often of prime importance. One should reflect on why such–and–such a site has this function within a graph and what it means in terms of the relationship between various ‘actors’ in the e–diaspora. Several types of ‘bridge’ may be identified including 1) the representative or spokesman, cited by ‘its own’ community and by others, 2) the mediator, which is cited by two communities but belongs to neither, and 3) the translator or commentator, which cites its own community but is not cited by it although it is cited by another. This map is part of the ‘Moroccans’ corpus. The sites yabiladi.com and bladi.net (in the centre) very clearly play the role of ‘bridges’ here. on the one hand (lower left) and to institutional sites (upper right) on the other. USING THEMATIC MAPS—STUDYING POLARISATION: Having identified the clusters/zones of the graph, one then has to fathom the reasons for these groupings and, to this end, researchers may use the various thematic maps stemming from their classification. Browsing these different maps, they first set out to find trivial groupings, which is to say situations where clusters correspond very clearly to the various values of a given classification field. Sometimes groupings of this kind are not observable, at least for certain clusters. One then has to set about looking for the phenomenon of polarisation by studying the distribution of the graph's ‘colours’/categories. One then examines how these various ‘poles’ distribute themselves, how they ‘constitute links’ between various different clusters. nodes of the same colour/category, covering, as it happens, migrants of the blogosphere. Right: Here we have a zone (more than one cluster) containing sites belonging to several categories. We may now affirm that the grouping on the right is defined primarily by linguistic criteria. and we can thus see that it is ‘language’ that links the various groups of sites. ‘INTRUDER’ SITES: We speak of ‘intruder’ sites when there is a situation in which a given cluster corresponds very obviously to one category but nevertheless contains a site or sites belonging to another. One then has to inspect why such a site should have ‘inserted itself’ in this way into a domain which is, a priori, not its own. Once again, the intruding site may help in understanding the relationship between various actors in an e–diaspora. on–religious) in the very heart of a cluster of orange (=religious) ones, especially in that it also exercises the function of a hub. In this map fragment, colours represent religions. especially in that it also exercises the function of a hub.